Discussion in 'Schrade Knives Collectors Forum' started by rprocter, Mar 7, 2008. I believe this is a 138L Bowie Hunter. There were several varients of the basic H-15 pattern, and also the Imperial versions. 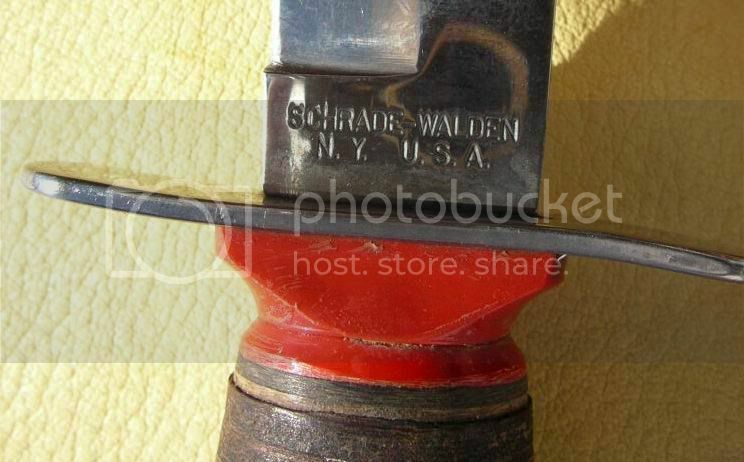 Some of the parts for the Schrade Waldens were actually produced by and purchased from Imperial. All of the variants were adapted from the MIL-K-8662 (AER) Pilot Survival Knife (16 October 1953 until 1957). Schrade won a bid in 1956 on 23,787 of this pattern knives for the Navy. The cost with sheath was ... $1.196 each. This last info from Frank Trzaska. Both Imperial and SW variants can be found with pommels and guards of aluminum, stainless, or carbon steel. And the pommel attachment means varies as well. The civilian knives would never meet Mil-Spec in this regard. The #138 "Bowie Hunter" had a 9 3/4" overall length, a saber ground carbon steel 5 1/8" clip point blade, leather washer handle with spacers, curved aluminum bowie style guard, and aluminum flat pommel. This pattern was a varient of the H-15. It was cataloged in1957, two years before the introduction of the H-15. It listed for $3.95 in 1962. 1973 ½ was the last year for this pattern, and it listed for $8.00. Your knife might well be stainless. Many of these were sold to Sears with an etch on the blade and the red spacers. Was that part of the Mil-Spec specs?? Was it cheaper to use plastic? Did they do rigorous ergometric testing and decided on plastic? Did they need it to make the weight requirements for the military? I think Sears favored the red spacers, IIRC. But they also used either brown or black spacers. 17 #4 Leather Washers per Kn. 6 #3 Leather Washers per Kn. 2 #2 Leather Washers per Kn. Thanks Codger. i'm just starting to acquire some older Schrade FBs. it's a whole new world ! what is the difference between a 138 and a 138L ? and why no pattern # on this knife ? was it common to omit it ? ....if you're interested the majority of the above knives are shown close up on my corner on Larry Vickery's website.I removed the handle material on one to show the full tang as well. Hard knife to photograph and show the blade etch. The scanner just wouldn't do it. Roland, no pattern #s, but they do conform to the drawings posted above as the 138L and 144L. I see the Codge has got the scan thing figured out. Nice Sears variants!!! Pattern numbers were sometimes included, sometimes not. The "L" suffix was a later advent when some patterns began having "S" suffixes indicating Staglon. "L", logically was for leather, and WW for Wonda-Wood, one of the early names for the polymer impregnated wood handles that evolved into Fibron (think LB-7). I've not seen these suffixes on a stamping, just ads, catalogs and factory paperwork. The same goes for special blade treatment suffixes like the STC for the tungsten carbide edged blades and the WE for Wonda-Edge serrated blades. ... I see the Codge has got the scan thing figured out. Nice Sears variants!!! ...How did I know Codger would have a The Kid/The Splendid Splinter/Teddy Ballgame/The Thumper model???!!! SW Ted WIlliams etched sheath knives would date roughly from circa 1961-1972. It is possible to find one prior to that with the J.C. Higgins "Our Own Brand" etch. Most of the Higgins branded knives (not all) date from the fifties/earliest sixties and are actually Western knives. Watch for that Platts patent number and the second pommel pin indicating a bifuricated (split) tang. This is another member's Higgins marked SW Bowie Hunter. I do have these, but the photos are from my archives, not from my collection. Some day I'll get a good camera, tabletop tripod and build a small lightbox. Until then I have to use my archived photos. My scanner, an HP Photosmart C5140 is a great scanner, but it has no depth of field for scanning knives. As a point of interest, compare the attachment means for the "Caps" (pommels) of your varients. You will see three or four different ones, including one drilled and pop-riveted, one smooth peened, and one peened with a drift punch. I don't have enough datable examples of these knives to do a proper survey of the method/pattern/dates. Back to the pattern number markings, I have a couple of SW sheath knives where the pattern number is not stamped, but rather a tiny etch. Also the pattern number may be a seperate stamp on the non-mark side. You'll note how on most of the SW sheath knives, the mark side was blade left. Near the changeover to Schrade, it was moved to the more familiar blade right. Also, mostly as regarding the Craftsman stamped sheath knives, the tang stamping may be oriented either read from the blade tip, or from the handle. Earliest Craftsman branded sheath knives simply had the Craftsman logo and slogan, sometimes sears number etched on a blade with production SW tang markings. Nice pictues. Made me dig my Bowie's out have a look at them again. I have what's seems to be the 138l Bowie the only markings is craftsman USA on blade is this still a schrade walden or just a craftsman version? SW. But to be sure better post a pic.